Snap out of the day-to-day monotony in the classroom by planning a virtual field trip to…anywhere. 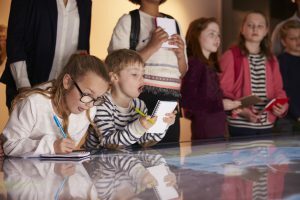 Virtual field trips are a great way to enhance your curriculum and make learning more engaging. They incorporate 21st century technology in a meaningful way, provide interactive learning experiences, and expose students to places they may never have a chance to visit in person. It is many things. 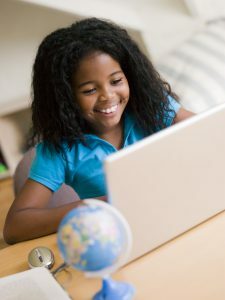 It can be as simple as providing students with an opportunity to visit a time or a place by examining a collection of photos, videos, or animations at a website. Or, it can be exploring cathedrals, castles, and palaces in medieval Europe through Google Earth Voyager. It can also be a live video conference with a curator from a museum or zoo who shares information and interacts with students in your classroom. Virtual field trips can be simple or as involved as you like. These trips are gaining speed with educators all over the country. The links below are examples of virtual field trips or tours that we found engaging, user-friendly, and easy to incorporate right away. Check them out and give them a whirl. Bon voyage and safe travels! Medieval Europe: Tour the Middle Ages of Europe. Can be used with SS 7th grade Social Studies (Lessons #77-86). Explorers: Lewis and Clark: Join Lewis and Clark’s expedition across the Louisiana Purchase. Can be used with SS 4th grade Social Studies (Lessons #89-90), or 2nd grade Reading Comprehension (Unit 10). Thanksgiving Traditions: Get a 360-degree view of where the pilgrims set off, landed, and settled at Plimoth Plantation. Can be used with SS 3rd grade Social Studies (Lessons 18-19). Into the Canyon: Grand Canyon National Park: This link gives you access to a website where you can learn about the geology and formation of the Grand Canyon. You can also find lesson plans and student activities. Grand Canyon River Archeology Virtual Tour: Stand beside archaeologists as they excavate artifacts along the Colorado River corridor. This site gives 360-degree views of excavation sites throughout the Grand Canyon. The Constitutional Walking Tour of Philadelphia: Visit all the historic sites of Philadelphia by downloading this virtual field trip. See where the Declaration of Independence and the US Constitution were created and so much more! The Statue of Liberty: This amazing virtual tour makes you feel like you’re standing right on Liberty Island. There are audio and video links for many of the slides that give you in-depth information about how the statue was designed and its symbolism. You can even enjoy the view from the crown windows! This can be used with the SS 2nd grade Reading Comprehension book (Unit 6).